Nearly 200 miles of a popular Yellowstone river is closed to the public, as thousands of fish have gone belly up in an “unprecedented” way. Officials in Montana suspect the cause is a human-spread parasitic disease. Fishing, rafting, swimming and other water-based recreational activities were banned for an undetermined amount of time as of Friday morning. The immediate closure is stretching from Yellowstone National Park’s northern boundary at Gardiner to the Highway 212 Bridge in Laurel, the area surrounding the affected zone. Officials from Montana Fish, Wildlife and Parks (FWP) say the 183-mile stretch of the Yellowstone River would not reopen until fish stop dying. As of Friday morning, up to 4,000 fish have been counted, but a real number is believed to be in the tens of thousands. 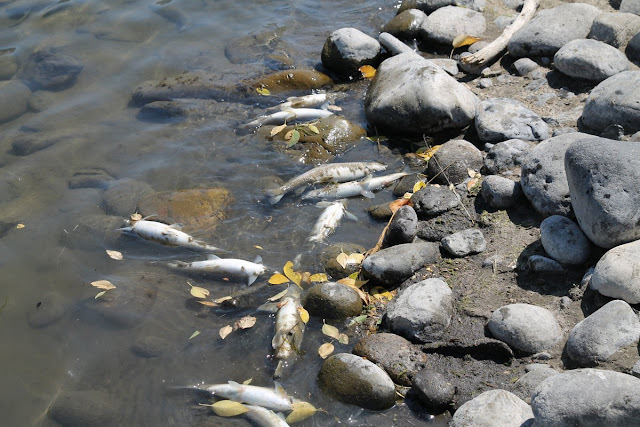 The fish kill has extended for nearly 100 miles, the FWP said. "This kill is unprecedented in magnitude. We haven't seen something like this in Montana," FWP spokeswoman Andrea Jones said. FWP said in a statement that test results from samples sent to the US Fish & Wildlife Service’s Fish Health Center in Bozeman, showing the catalyst for this fish kill to be proliferative kidney disease. “It’s one of the most serious diseases to impact whitefish and trout,” Jones said.